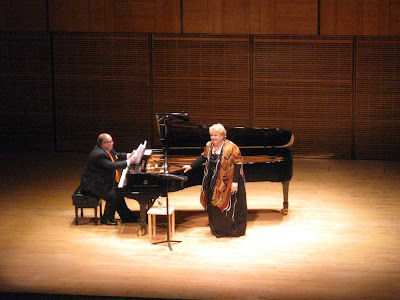 Last night, Christine Brewer made her Carnegie Hall debut with her recital at Zankel Hall. I was expecting to hear her very big voice, but it was powerful in every sense of the word. It is big, but its warm quality is like dark molasses, slowly filling every empty space. Her high notes are thrilling, but her bottom register is practically sensual. The program was wonderful. I particularly loved her breathtaking performance of Wagner's Wesendonck Lieder, Op. 91. Christine subtly and tenderly captured every emotion - a surprise to me since I'm new to Wagner in general and expected only a glass-shattering dramatic soprano. The text of the second half of the program was in English and here her fun personality shone through, as she conveyed every ounce of humor. The joy in her voice was the greatest discovery. It was only enhanced by the happy look on her face as she sang and comfortably talked to the audience. She seems to be quite a character and could probably talk up a storm. Song recitals can be thrilling or emotional, but they are most fun when there is joy and laughter. This was not lost on the audience who applauded long and loud at every opportunity. Finally, she shared a cycle of songs she called Nightingale Songs that she put together in tribute to her first voice teacher and predecesor sopranos Helen Traubel, Eleanor Steber, Eileen Farrell and Kirsten Flagstad. Her teacher saved the programs of times he saw these sopranos and wrote notes on them, including their encores. She shared these: "Sing to Me, Sing", "Night", "Hickory Hill", "Love Went a'Riding", "If I Could Tell You", and "Hills". She got a big laugh when she invited us to sing along on "If I Could Tell You". She said that some of these are out of print, but that voice teacher left her all of his music when he passed away. What a lovely legacy and tribute. Her encores were Harold Arlen's "I Had Myself A True Love", the hysterical "Review" by Dougherty(which reminded Sally and me of one of Ben Moore's comic songs ) and the traditional "City Called Heaven" arranged by Hall Johnson. 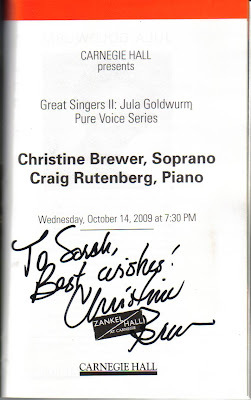 Craig Rutenberg was Christine's very able and even more good natured accompianist. After, we went backstage to meet her, thanks to a mutual friend. The backstage corridor was filled with happy people and Christine was the head of it all, laughing and being wonderful. I'm seeing her at least twice more this season - in Elijah with the Boston Symphony Orchestra at Carnegie Hall (Stephanie Blythe too!) and in Misssa Solemnis with the New York Philharmonic at Avery Fisher Hall (Stephanie Blythe too! + Eric Owens, whom I just had to meet last night too). Great review that really captures what being in the presence of Ms. Brewer is like and helped me relive last Saturday night in Atlanta a little. Jealous of your encores -- we got City of Heaven and Mira from Carnival. Good house, I hope? Atlanta came through yet again with barely a half-full house for a great artist(Spivey Hall only seats 400). Hi William - Like you, I just want to relive it all over again! Zankel has 599 seats - I would say that at least 500 were full. It was a very appreciative audience and applauded loud and long before she even sang a note. Have you ever heard Deborah Voigt? If you have, I would love to hear your comparison of the two. I am happy that your experience was so memorable. By the way, that hall looks to be the same place as where the televised version of "From the Top" is recorded. Hi Tyler - Yes, I've heard La Voigt many times, both at the Met and at Carnegie. She's wonderful. I will hear her again this season in Elektra at the Met. She and Christine are very different but I don't feel they merit comparison. Yes, Some of "From the Top" is recorded at Zankel. It's sort of behind and under Stern Auditorium (the main Carnegie stage). I've met Eric Owens when he came to our office to do an NEA taping. I just want to run up and give that guy a big bear hug. He's singing Porgy in April when you guys come.